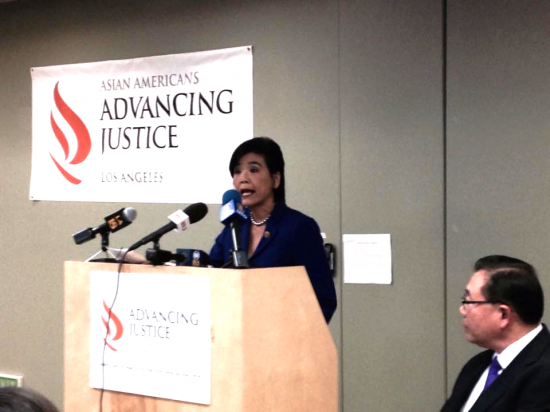 Rep. Judy Chu and Asian Americans Advancing Justice-LA President/Executive Director Stewart Kwoh at a press conference on Nov. 21. After years of advocacy led by undocumented immigrants, President Barack Obama on Friday announced executive actions that potentially will provide nearly 5 million undocumented immigrants, including approximately 400,000 Asian immigrants, with temporary relief from deportation. While this is an important step towards keeping immigrant families together, it also means that nearly 6 million immigrants are still at risk of deportation and that Asian immigrants will still have to wait decades to join their family members in the U.S. due to the nation’s overwhelming visa backlog. “While we welcome the new programs that will help many undocumented immigrants, we also vow to continue the fight to ensure that all immigrants are safe from deportation, reunited with their families, and treated with dignity and respect,” said Stewart Kwoh, president and executive director of Asian Americans Advancing Justice-Los Angeles. • Deferred action for parents of U.S. citizens and legal permanent residents (LPRs) — The Department of Homeland Security (DHS) will establish a new Deferred Action for Parental Accountability (DAPA) program for parents of U.S. citizens and LPRs who are not enforcement priorities and who have been in the U.S. for more than five years as of the date of the president’s announcement. Individuals will be able to request temporary relief from deportation and work authorization if they come forward and register, submit biometric data, pass background checks, pay fees, and show that their child was born before Nov. 20, 2014. Relief will be granted for a three-year period. The DAPA program will not commence and applications will not be accepted until 180 days after Nov. 20, 2014. • Expansion of Deferred Action for Childhood Arrivals (DACA) — DHS will expand the existing DACA program so that individuals who came to the U.S. as children can apply if they entered the U.S. before Jan. 1, 2010 (instead of June 15, 2007, under the existing DACA program). In addition, there will no longer be an age cap so that individuals will be eligible for DACA regardless of how old they are now. Going forward, DACA relief will be granted for a three-year period, instead of two years. • Streamlined legal immigration provisions — Obama also announced several executive actions to streamline legal immigration, including providing portable work authorization for high-skilled workers awaiting LPR status and their spouses; reducing family separation for those waiting to obtain LPR status; enhancing immigration options for foreign entrepreneurs who meet certain criteria; and issuing a presidential memorandum on visa modernization. The president’s actions have a significant impact on Asian Americans and Pacific Islanders (AAPIs) in California, where an estimated 15 percent of the state’s undocumented residents are Asian, comprising approximately 416,000 people. Of those, 130,000 are in Los Angeles County and 52,000 are in Orange County. Statewide, Advancing Justice-LA estimates that the largest groups of undocumented Asians are: Filipinos (143,000), Chinese (76,000), Koreans (71,000), Vietnamese (60,000), and Asian Indian (46,000). The number of undocumented AAPIs in California who would be eligible for the new and expanded programs is a subset of this larger undocumented population. Nationally, the number of eligible AAPIs is estimated at approximately 400,000 but there is not a current estimate for California. “This is a day of historic significance for millions of Asians and Pacific Islanders (APIs) and immigrant families. The president’s executive actions will benefit many aspiring Americans, including the over one million undocumented APIs in the U.S. who are already woven into the fabric of our society. “As we move forward, I will continue to push for policies that our community needs. For instance, there are still a disproportionate number of APIs languishing in our family and employment visa backlogs, some of whom have waited decades to reunite with their loved ones. We must be the voice for these individuals and others who are still in the shadows. “I look forward to continue working with the Obama Administration — especially with the new interagency Visa Modernization Task Force — to achieve a fair and accountable system for all. After meeting with the president on Wednesday night, I am confident that he is committed to working with our caucus to address the needs of the API community. Once the implementation process is finalized and U.S. Citizenship and Immigration Services (USCIS) begins to accept deferred action applications of parents of U.S. citizens and LPRs in May 2015, Advancing Justice-LA will expand its services and help eligible individuals apply for the new immigration benefits under the president’s executive action. In the meantime, Advancing Justice-LA urges impacted community members to be cautious. “Given that the DAPA program (deferred action for the parents of U.S. citizens and LPRs) will not be implemented until May 2015, we urge impacted community members to beware of any individual or group that falsely claims that people may start the application process now or that they can ‘save a place in line,'” said Karin Wang, vice president of programs and communications at Advancing Justice-LA. In the immediate future, Advancing Justice-LA will begin providing information to the community about the president’s executive actions, how to prepare to apply for relief, and how to beware of and protect yourself from fraudulent immigration scams. During this waiting period, the community is encouraged to begin preparing by gathering documents that will prove certain requirements, such as identity, relationship to a U.S. citizen or lawful permanent resident, and proof of having lived continuously in the U.S. for five years or more.